Subtitle to post: Yes Gertrude, gauge does matter. What you see above is my Today's Sweater for P3, so-called because I cast on the day of the Today's Sweater presentation. I dutifully knit my way through half of the colorwork chart for the bottom hem before I got home, and was very pleased with how things were turning out. But when I got home, I put the sweater down for a few days, and when I picked it up again, I began to have the sneaking suspicion that all was not well in River City. I knit a few more rows, all the while knowing, without a doubt, that I was going to have to rip out the entire thing and start over again. Why was I going to have to rip out? I hear you asking. Well, dear readers, the answer is: swatches lie. Now, perhaps they don't lie if you do a proper swatch, aka cast on 40 stitches, work in pattern for 6 inches and cast off, block the swatch, and then allow it to hang from one side for a few days so that the weight of the piece can work whatever voo doo it will do on your knitting. However, if, in a fit of wool fever, you knit a swatch that is approximately 2 inches by 3 inches while on the train to a knitting retreat, then block it by hastily wetting in from a bottle of water in a deserted Welsh train station while waiting for your connection and then have a complete and utter brain fart regarding the actual required gauge of the pattern of interest (note: 6 stitches per inch is in no way the same as 6.5 stitches per inch, just for the record), you may have problems such as the one I encountered. My supposed-to-be 42 inch sweater was actually closer to 48 inches around, giving me approximately 8 inches of ease. And even for a comfy, oversized sweater that is destined to be worn as outerwear, 8 inches of ease is too much. Waaaay to much. So, with much muttered obscenity and a few tears, my 4 inches of Today's Sweater became piles of loose yarn, and I retreated to the comfort of Open Office spreadsheets to figure out what to do. I'm already knitting on US 2 needles, and I have absolutely no desire to go down a needle size, so I plugged in my gauge and the stitch counts, and have figured out that I can knit the next size down and get something that will fit. Hooray! You may also notice that I've changed from a ribbed bottom edge to garter stitch. It just seemed better that way. Onward to rustic wooly goodness! 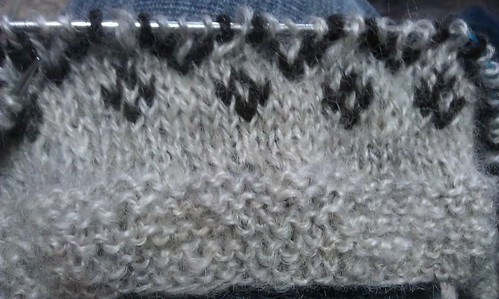 Written by porpoise On October 27, 2012 In "handspun", "sweaters"